This was pretty weird and kept me guessing for a long time. Was the protagonist really able to sense shape shifting goblins or was he psychotic and killing people because of a hallucination? It is set mostly in a carnival and the author seems to have done some research into carny slang and lifestyle, but occasionally slips up and has things like elephants that you would only see in a circus. The side show seems a little elaborate for a carnival too but I just suspended my disbelief and read further. I'm glad I did. There are some high action moments and toward the end the tensions get high. 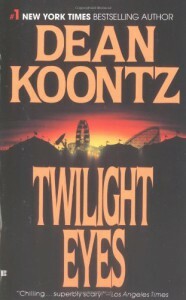 I can see why this is one of Koontz's most popular stories. There are plenty of surprises in the twists and turns of plot and I honestly couldn't predict exactly how it would end or whether any of the leading characters would make it through.